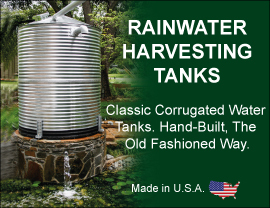 Norwesco tanks are used for a wide variety of applications including the storage and/or transport of potable water, gray water, wine, most liquid agricultural chemicals, and many industrial chemicals. Norwesco polyethylene (poly) tanks are manufactured by means of the rotational molding process, which produces a one-piece, seamless, watertight tank. Linear poly tanks are molded from 100% FDA approved materials and are therefore safe for storage of food products and will not impart any taste or residue. Norwesco brand poly water tanks are UV stabilized and will not breakdown under harsh outdoor weather conditions. Standard weight tanks (White Color) will safely handle liquids with a specific gravity up to 1.5, weighing up to 12.5 Lbs. per gallon. Heavy-duty tanks (Blue Color) will safely handle liquids with a specific gravity up to 2.0, weighing up to 16.5 Lbs. per gallon. The natural opaqueness of linear or crosslink poly allows for easy viewing of liquid levels. These Norwesco tanks are designed to withstand sustained temperatures up to 120º F, and peak temperatures up to 140º F.
A pre-installed outlet drain fitting on one end makes plumbing hookup easy. Horizontal leg tanks have molded-in legs to help reduce sloshing and allow for easy securing of the tank to the truck. Whether using the tank in a stationary position or for transport, full-bottom support and the appropriate bands are required to validate the warranty and to ensure that the tank retains its shape and integrity. American Tank Company supports Norwesco's 3-year manufacturer’s warranty dependent on the chemical compatibility of the intended contents with the tank, tank fitting, and fitting gasket materials. Norwesco tanks are not Department of Transportation (DOT) rated.